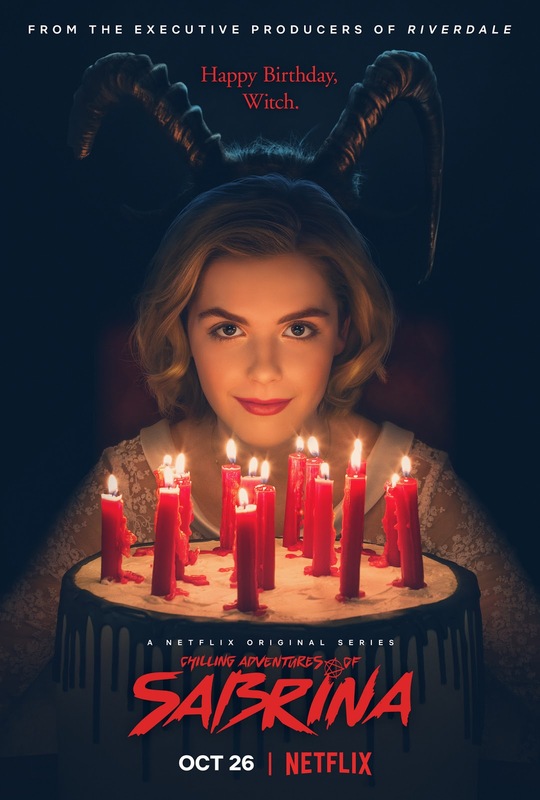 If you haven't heard about the new Netflix show, The Chilling Adventures of Sabrina, where actually have you been?? This is a completely different take on the Sabrina the Teenage Witch story line, and if you go into it thinking it will be like the original show, I can tell you right now that you won't like it. But if you take it for what it is, a TV adaptation of a dark witch comic, you'll really enjoy what Netflix has put forth. The new show is actually based off of the comic of the same name, and it has a much darker, more twisted feel than the bubbly Sabrina of the 90s. We're talking necromancy, satanic rites, cannibalism...the list goes on. Of course I binged this show over the weekend and personally really adored the new dark twist on the old classic. 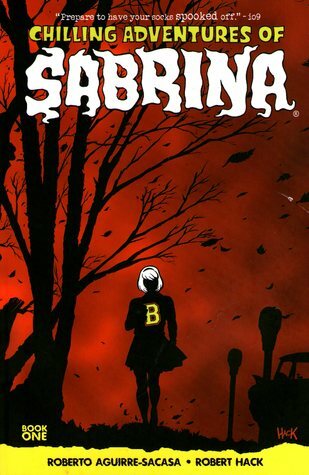 If you have read The Chilling Adventures of Sabrina comic, you'll definitely see the similarities, but there are a lot of differences as well. I loved that the show intro took art directly from the comic! 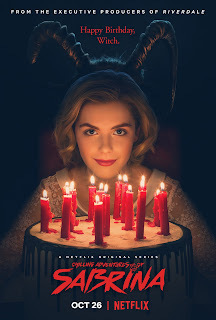 In both versions, Sabrina is about to celebrate her 16th birthday, and with it, her Dark Baptism-the act of signing her name in the Devil's book. In the comic, she is all for it, but in the show, she starts to question her freedom and dissent against Church of Night tradition. I love the portrayal of Hilda and Zelda in both versions. The TV Sabrina definitely got on my nerves, however, as her attitude of going against literally everything and not caring who it might impact really rubbed me the wrong way. I am OBSESSED with Ambrose as a character, and would love for him to get his own spin off, in either comic or show form! While Salem does talk in the comic, unfortunately he does not in the show. I loved the overall vibes of witch feminism and female power. Overall, I think Netflix did a great job adapting the comic. There were some differences, most likely to build the plot into the length of a full tv season, but there were a lot of things they remained true to as well. Some of the acting bothered me with the Netflix version, and like I said, I wasn't a fan of their portrayal of Sabrina. While you don't need to read the comic to enjoy the show, you definitely should! The comic art is unique and beautiful, and it's the perfect, fast read if you want to squeeze in one more spooky book before Halloween! I got this book in an OwlCrate months ago and was just never drawn to it. I decided to try it out this month since I heard it had some spooky vibes, and I'm sure glad I did! 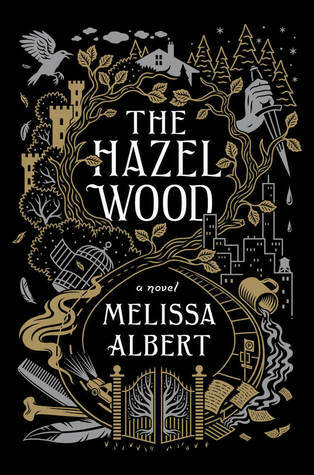 The Hazel Wood by Melissa Albert follows teenager Alice, who moves all over with her mom Ella trying to stay away from bad luck. Alice's grandmother is the author of the famous Tales from the Hinterland, a fantasy novel with a cult following, and when Alice and her mother receive the news of the grandmother's death, they believe that the bad luck is finally over. That is, until Alice's mother is taken by someone who claims to come from The Hinterland. 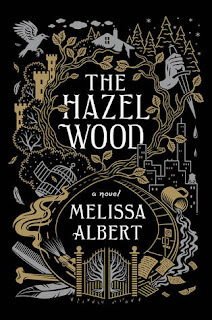 Now Alice must come face to face with her grandmother's stories, stories which she has been shielded from her whole life, and head to her reclusive grandmother's estate, The Hazel Wood, in the hopes of saving her mother. This story really was unlike anything I've ever read! It had magical realism, fantasy, thriller, mystery, and contemporary elements all wrapped up into one story. It had some of the Hinterland fairy tales themselves interspersed throughout, which I especially enjoyed. While I wasn't a huge fan of the main character, the plot and side characters were more than enough for me to fall in love with this book. It was fast-paced and exciting. It was twisted and creepy with all kinds of dark Alice in Wonderland vibes. And it definitely left me wanting more. After doing some research, this appears to be the first in a duology, and we might even get a Tales from the Hinterland storybook as well! I need those fairy tales! I will definitely be keeping my eye out for those, as I'm not at all ready to give up this world yet. I've loved everything I've read by Victoria (V.E.) Schwab thus far. So when I saw she was releasing a creepy middle grade novel, I knew I had to pick it up (even though middle grade normally isn't my thing). 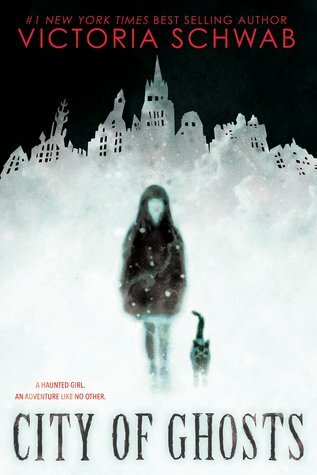 Unfortunately, City of Ghosts by Victoria Schwab didn't quite live up to my (perhaps too high) expectations. This story follows Cassidy, who travels with her parents to Edinburgh while they film the first episode of their ghost hunting TV show-The Inspectres. Her parents are obsessed with ghosts, but Cassidy can actually see them. In fact, her best friend is a ghost named Jacob who saved her life when she almost drowned. When Cassidy encounters more ghosts in Edinburgh than she knows what to do with, she meets Lara, another girl with the same gift who helps to enlighten Cassidy on her purpose. While I chose to get the UK paperback edition (because the cover is just so gorgeous), I'm disappointed that both covers lead the reader to believe that the cat (affectionately named Grim) is a major player in the story. Spoiler alert: he isn't. The story itself felt very one dimensional to me. I should have been on the edge of my seat during certain parts of the plot, but I just wasn't. As a fan of any creepy read, I'm normally completely enveloped in these types of stories. I liked the characters enough, but overall something just felt missing. I also would have loved to know more about Lara. Granted, this is a middle grade read, so I might be looking for a depth that just doesn't exist in books for a younger age group. It also took me a lot longer to read than I anticipated. The story was cute and overall I enjoyed the time I spent with it, but I wouldn't pick it up again, it didn't really stick with me, and I was definitely left wanting more. I think this is supposed to be a duology, and I did like it enough to still check out the second book when it comes out. Hopefully that one will have a little more of what I was looking for! Step right up, get your perfect Halloween read here! I knew from the minute I saw The Wicked Deep by Shea Ernshaw that I would love it. I actually bought this book the day it was released back in March, but made myself wait until closer to Halloween to read it. And it was definitely worth the wait. This book takes place in the small town of Sparrow. Every summer, a terrible curse befalls the town and it is forced to pay retribution for something it did two centuries ago: drowned the three Swan sisters for witchcraft. Now, each summer the sisters return from their watery grave, each inhabiting the body of a teenage Sparrow girl and luring boys into the water to their deaths. The town has accepted that this is their fate, and the "Swan season" has even become a tourist attraction of sorts. This story follows Penny Talbott during the Swan season, but this summer is different. Enter Bo, an unsuspecting visitor to Sparrow who seems to not know the danger he has put himself in by visiting during this time. Ugh this book, I just adored every minute of it! Both the present day plotline and the flashbacks to the sisters had me so immersed in the town of Sparrow, and I could picture everything so vividly in this atmospheric read. While I did figure out the twist (if you can even call it a twist, because it happens fairly early on), that didn't detract from my enjoyment of the story whatsoever. My only real dislike (and not even a dislike enough to take off a star) was the unlikely romance, but if you take it with a grain of salt it doesn't distract from story as a whole. The very end threw me a bit, but it's satisfying when you realize that Penny isn't as much the main character as you originally thought. This would make an amazing movie (which is good, because it looks like it's happening). 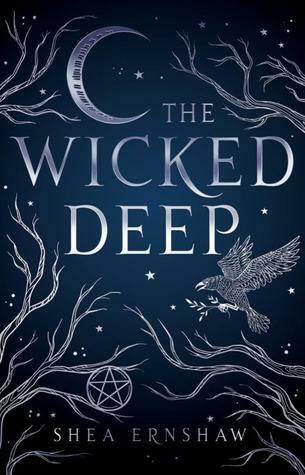 Fans of Hocus Pocus and anything witchy will absolutely adore this read! And because it has to be said, this gorgeous, holographic cover may be the most beautiful book I've ever seen! This is the second computer/tech read that I've picked up in the last few weeks. 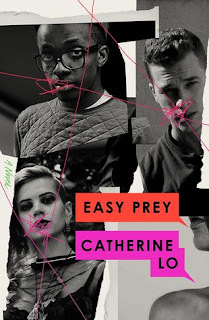 Easy Prey by Catherine Lo follows three teenagers: Mouse, Jenna, and Drew. After being thrust into a group project together for law class, these three unlikely friends have to work together. Mouse is a computer nerd set on getting into MIT to prove his father wrong. Jenna, after having some personal photos broadcast over the internet, is a changed girl, rebellious and jaded. And Drew is a jock, known for being a womanizer and a player. Somehow these three had access to a teacher's racy photographs, and when the photos go viral, they have to figure out who leaked them. This story was actually really good! It's told from the points of view of each of our three main characters. Its focus on internet privacy and online rights, in addition to victim shaming, was definitely relevant to society today. I liked how all three characters were sort of intertwined before they got put in a group together, but the forced pairing really brought out their relationships with each other. The twist wasn't really predictable, per se, but definitely made sense when you finally learned it. This was a quick, relevant read with some good characters and a pretty solid, thrilling plot. Thanks so much to Amulet Books for an advanced copy of this read! 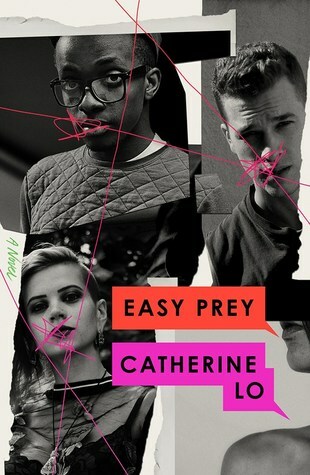 Easy Prey by Catherine Lo releases October 16th! This is a release I have definitely been anticipating, so you can imagine my excitement when a finished copy showed up at my door! 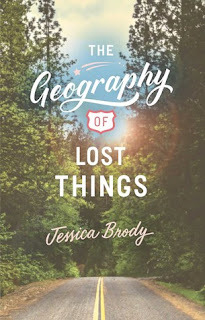 The Geography of Lost Things by Jessica Brody is a YA contemporary that follows Ali on a journey, both physical and emotional in nature. When Ali's estranged father passes away and leaves her his most prized possession, his 1968 Firebird convertible, she wants nothing more than to get rid of it. In fact, Ali plans to sell the car and use the money to help save her house currently under foreclosure. But Ali can't drive a stick-shift, and she has to transport the car about 300 miles to its buyer. Enter Ali's ex-boyfriend, Nico, who offers to drive the car for a small cut in the sales price. But that means Ali must spend hours trapped in the car with her ex. What happens when the two are forced together? Will Ali learn to forgive not only Nico, but her father as well, in the process? Will she be able to save her home? This story was just too precious. I loved the characters, even though I thought Ali was a bit standoffish (though I understand why). The whole idea of "trading up" items from something worthless to something worth a lot of money is so fascinating to me, and I've always wanted to try it! I thought the overall message of this book about forgiveness and understanding was incredible, and it really hit home the idea that you shouldn't judge someone without fully knowing their situation. I thought this was fairly long for a YA contemporary, but I flew right through it. And let's be honest, this cover is just stunning. I've never read any of Jessica Brody's other works, so now I definitely have to check out some of her other books! Thanks so much to Simon Pulse for a finished copy of this read! The Geography of Lost Things is out now, so be sure to pick up a copy! This book completely blew me out of the water! I've never read anything by Diane Chamberlain before, and honestly didn't know much about her books at all. When I got a chance to read this one, I was cautiously optimistic since I didn't know what to expect. But I ADORED IT. 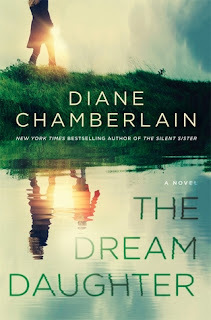 The Dream Daughter by Diane Chamberlain can't even be summed up into one genre, because it had so many different components. This story follows Carly, a widow living in the 1970s whose husband has been killed in the Vietnam War. Shortly after he was deployed, she discovered that she was pregnant. But now there is something wrong with her baby that could be fatal, and there is no cure. Enter Carly's brother-in-law, Hunter, who tells Carly there might be a way to fix the baby's heart condition, but it will require immense bravery and suspension of disbelief on Carly's part to make it happen. Suddenly Carly is faced with a decision: to put trust in the incredulous information her brother-in-law has told her and attempt to save her unborn daughter, or to not believe it and pray that the doctors were wrong. I honestly can't say too much about this book without giving critical elements away, but I was gripped from the very beginning. I stayed up WAY past my bedtime to finish this read, and the plot captured me more than any book I've read in a long time. I enjoyed all the characters, with the exception of Carly's sister, and even though there were definitely elements of the plot that were unrealistic, it was an incredibly unique and engrossing read. Thanks so much to St. Martin's Press for an advanced copy of this read! The Dream Daughter by Diane Chamberlain is out TODAY, so be sure to pick up a copy of this fantastic book! I was not expecting to enjoy this book as much as I did. The Chaos of Now by Erin Jade Lange is a YA contemporary that follows Eli, a high school student obsessed with computers and coding. The book starts one year after one of Eli's classmates, Jordan Bishop, committed suicide by lighting himself on fire in the middle of the cafeteria, with bullying as the cause. There is definitely a trigger warning on this book for bullying and suicide. Eli himself is a victim of bulling, having most recently been beaten up in the bathroom. But immediately following his beating, Eli is left a code in a computer language very few can understand. The code leads him to some new friends and a slot in a team for a major coding competition. But when the team's competition project turns into a vehicle for revenge on Jordan's death, Eli isn't sure he wants to stay a part of it, especially when his own secrets are at stake. 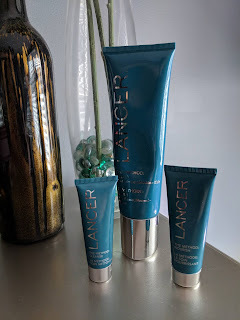 I really enjoyed this read! I liked all of the characters, and thought the plot was fast paced and engaging. This was definitely focused on the harm that bullying can do, but had a great techie aspect to it as well. I did think that some parts were a little bit unrealistic, both some actions and some repercussions. I absolutely appreciated that the love interest was not at all the center of this story. 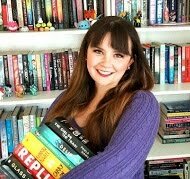 Fans of books like Warcross, and those interested in computers, technology, and coding, would definitely enjoy this read! Thanks so much to Bloomsbury for an advanced copy of this read! 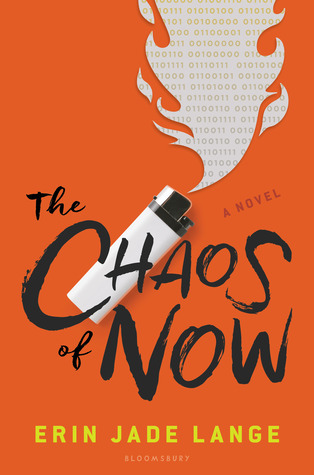 The Chaos of Now by Erin Jade Lange is out TOMORROW, Oct. 2nd, so be sure to pick up a copy!